Philippians 3:13-15 Brethren, I count not myself to have apprehended: but this one thing I do, forgetting those things which are behind, and reaching forth unto those things which are before, I press toward the mark for the prize of the high calling of God in Christ Jesus. Let us therefore, as many as be perfect, be thus minded: and if in anything ye be otherwise minded, God shall reveal even this unto you. Apostle Paul acknowledged that he isn’t at a level he wanted yet. He has not yet arrived. That he was still a work in progress. He does not consider himself to have attained or have taken hold of the fullness of Christ, neither has he reached his desired goal. He realised that God is still pruning and shaping him. He also said he was striving to improve. That he would not give up. That his goal is a definitive mark of a higher calling of God in Christ. He also challenged every child of God to have the same mind as well, that we may not have become who and what we wanted; but we can get there. You may not be where you ought to have been. You may not be where you really want to be. But guess what? You are pressing on. Press forward or pressing forward is an idiomatic expression (informal language that has a meaning that is different from the meaning of the words used in the expression, e.g. Hold your tongue: does not mean use your hand to hold your tongue, but to keep quiet). So press forward means to make progress. Other synonyms of press forward are advance; make up for the list time; pick up speed; proceed forward; press on. I could have titled the message “You will press forward”, which could have been a prophetic declaration and prayer (which I will still do); but I have put it as “I will press forward”, which is a personal declaration; a decree; a confessional statement; and a desire of what is needed. When the word press is used, what comes to mind readily is pressure exerted or force applied. Whether it’s in ironing of clothes, pressing against an object or as in producing printed materials. Pressure and force are applied. From today, may you receive the required strength to press forward in life. One of the hard situations in life is when a woman is in labour. There comes a critical point when the baby is about to burst forth. If the woman couldn’t press forward anymore, two destinies will be at stake; except certain emergency measures are quickly applied. There is someone reading this, your destiny is at a critical birthing stage. Receive the power to bring forth in Jesus name. To someone else, I’m asked to tell you that at the end of it all; nothing shall be lost. Why do I need to press in order to move forward? Why can’t I just be forward, without having to press? You will need to press because moving forward is never easy. There are two forces that act on an object that tries to move forward: Gravity and Drag. Gravity tells the object not to try and lift off the ground. Drag tells the object to stay put where it is. For an object to achieve an advance motion, therefore, an internal or external force has to be exerted by or on that object in order to press/thrust forward. May your destiny defy the laws of gravity. May your destiny supersede the power of drag. Both the power that presses down and the power that pulls back, may you not answer to any of them. Receive the push effect from Jehovah the unmatchable God. Enjoy the lift from the Everlasting Arms of God. Why should we press to move forward? Because the end of the tunnel is now closer than what it was before. Apostle Paul letting the Romans church know that help was closer to them then than how it was before. For those who understand the time. There are 24 hours in a daytime. There are hours of sleeping and hours to awake and work. The hour to wake up has come. Permit me to declare to you that salvation is now near. You believed before. Believe it again now. Your supernatural advancement commences now. The Bible gives us examples of those who pressed forward and as such their destinies became glorious. Yours will be glorious as well. In Luke 5:1-10, Apostle Peter had a life-changing experience with Jesus. From that incident, he would have become a fish merchant; he, however, left all the catch and followed Jesus. He was later used by God to catch multitudes of souls of men instead because he pressed on. I am asked to tell someone or remind them that their destiny is more than ‘fishes’. Souls of men are waiting for you. Be closer to Jesus and serve Him passionately, your reward shall outweigh the ‘fishes’ you are chasing. In Mark 10:46-52, the bible tells us about a man that pressed forward despite his predicament and circumstance. His life then became glorious. His was called Bartimeus son of Timeaus. He was blind. He was a beggar. He chose a busy road to beg for alms. On that fateful day, the traffic of the people passing was unusual. He asked what was happening. He was told that Jesus Christ of Nazareth was passing. From that point, he was determined to press forward to Jesus, the only One who could transform his destiny. What was a blind beggar doing beside the highway? That could be very dangerous! How did he know when to raise his voice? How did he know what sentence to shout? How was he able to shout louder than the crowd? Why didn’t he get discouraged when he was told to shut up? Why didn’t he ask for lots of money so as not to beg again? After receiving his healing, why didn’t he go back home? He, however, followed Jesus in the way. There is someone reading this, God says I should tell you to position yourself by the ‘highway’. He says, you are presently on a ‘country road’. Where you need to be to press forward is by the ‘highway’. God said the person I am talking about will understand what that means. The Divine connection you need will locate you on that ‘highway’. To another person, the Spirit of God says the grace necessary for you to press forward is available right now. Receive that grace in Jesus name. The question of when to act for you to press forward, may you not miss it. What to say, may you not miss it. How to say it, may you not miss it. May the intimidation of men do not discourage you. In Mark 5:25-34, the Bible tells us of the woman of the issue of blood. She had been in that situation for 12 years and had lost all that she had in the hands of the physicians while looking for a cure. But when she heard that Jesus was passing; she pressed through the crowd with the whole strength she had left, touched Jesus robe and she was healed! There is someone reading this, the reason why you have not progressed beyond your present state is that you have been experiencing gradual leakage, now and again. As things are building up for you, they just leak with style. I’m asked to tell you that the leakage have now stopped. You will notice pretty soon. You will suddenly make an advancement to a level you haven’t made before. Every virtue that has seeped out of you are now being returned in Jesus name. Psalms 84:7 – They go from strength to strength, every one of them in Zion appeareth before God. Job 17:9 – The righteous also shall hold on his way, and he that hath clean hands shall be stronger and stronger. Psalms 92:12 – The righteous shall flourish like the palm tree: he shall grow like a cedar in Lebanon. Exodus 12:37 –And the children of Israel journeyed from Rameses to Succoth, about six hundred thousand on foot that were men, beside children. Genesis 26:13-14 – And the man waxed great, and went forward, and grew until he became very great: For he had possession of flocks, and possession of herds, and great store of servants: and the Philistines envied him. Joshua 14:10-11 – And now, behold, the Lord hath kept me alive, as he said, these forty and five years, even since the Lord spake this word unto Moses, while the children of Israel wandered in the wilderness: and now, lo, I am this day fourscore and five years old. As yet I am as strong this day as I was in the day that Moses sent me: as my strength was then, even so is my strength now, for war, both to go out, and to come in. 2 Peter 1:5-8 – And beside this, giving all diligence, add to your faith virtue; and to virtue knowledge; And to knowledge temperance; and to temperance patience; and to patience godliness; And to godliness brotherly kindness; and to brotherly kindness charity. For if these things be in you, and abound, they make you that ye shall neither be barren nor unfruitful in the knowledge of our Lord Jesus Christ. Forget the past: mistakes, achievements, blessings. Reach forth to things ahead: opportunities, successes, blessings. Have a higher mark/prize in view: better result. Commit your ways to God in prayers. The Power that promoted David from a captain of 600 men to become the king over Judah and then king over Israel; enable my destiny to reign and rule in my lifetime. The power that moved Mordecai from the king’s gate to the palace; move me into a position of prominence in life. The power that moved Jephthah from a leader of vagabonds to become the leader of Israel; turn me into an extraordinary being. The power that fast-tracks the destiny of Joseph from the dungeon to the highest possible position in Egypt; make my destiny count in this land. The power that transforms Saul of Tarsus from the murderer of saints to the chief-most apostle; transform me into a mighty vessel in your hands. 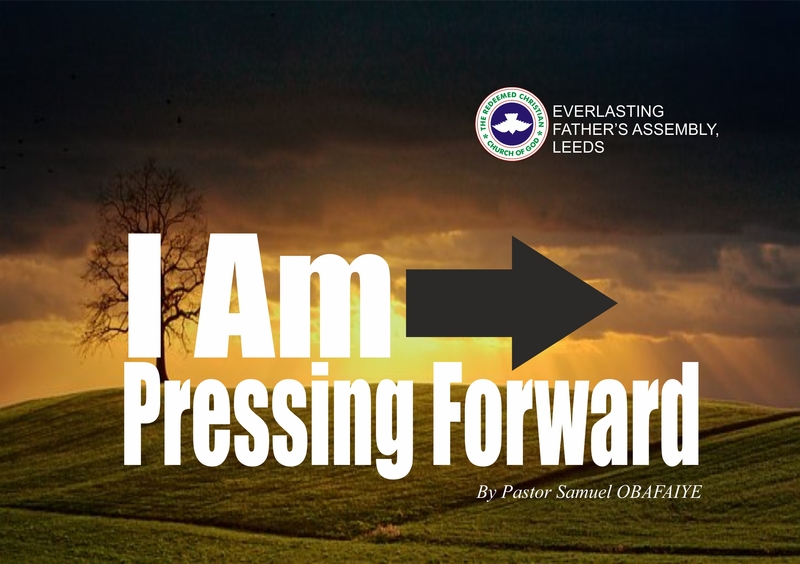 The sermon, I Am Pressing Forward, by Pastor Samuel Obafaiye, was delivered on Nov 4, 2018.